Accessible kitchen design doesn’t happen by itself; it’s planned. By implementing Universal Design into your kitchen remodeling project, you can create a space that is easier to use, much more efficient, more safe and more enjoyable for everyone; especially you. And, though it is true that we have years of experience creating accessible kitchens, there is one thing I won’t ever know until you tell me: How you want to use your kitchen. That is one thing that I go over with almost every one of our Cincinnati and Lovelend customers. And, one of the most important things you should think about before you ever talk to a professional home Remodeler. To that end, here are a few things to help you make sure you’re considering the right things for your remodeling project. When you start to create your accessible kitchen design, focus on what you want to do and how much. This will help ensure that the finished project not only meets your needs, but will also work for you. Is cooking a passion? Or, do you prefer quick and easy meal preparation? Both of these will require a different approach to efficiency and ease of use, since cooking more means you need access to more things in the kitchen. Are you more about the microwave, do you prefer full-blown, personality chef-inspired meals or somewhere in between? How much you like to cook is going to affect what you want out of your kitchen. Generally, the more you love it, the more functionality you’ll want. In traditional kitchen design, the space incorporates a work triangle. (I.e. The stove, sink and refrigerator.) While those are important, this work triangle has to be adapted for your specific use and include all work areas. For instance, there may be differences in the accessible kitchen design features you would implement if you use a wheelchair versus a walking device versus a power chair. This means a keen eye on the efficient use of space, and creating areas and surfaces where you can prepare and create more easily. As well as, being able to see, reach and use the tools and appliances you may need. One component of an accessible kitchen design that is often overlooked is how easily it can be cleaned by the person (or people) it is designed for. We’re actually going to talk about this more in an upcoming article. Until then, think about these things. Lower maintenance materials, fewer nooks-and-crannies, fewer surfaces that require special care or cleaners … that equals less time and effort on your part to keep it clean. Thinking about cleaning also will provide a level of efficiency for your kitchen duties. 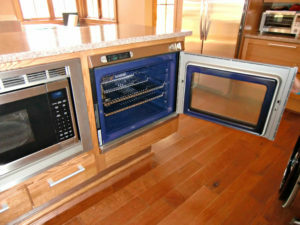 If you have any other accessible kitchen design considerations that you think should be included, let me know.